High compaction force combined with fast forward and reverse travel means the DPU 4545He achieves great productivity. It is an all-around versatile plate for all job sites that place high demands on the machine’s performance potential. Its other outstanding characteristics are high operator comfort and a long service life. It is perfectly suited for the compaction of building back-fill, and of frost and sub bases when constructing roads, paths and parking lots. 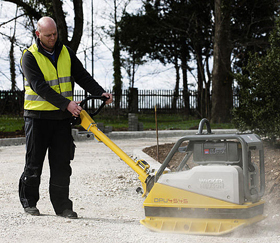 The 69 Hz frequency makes the DPU 4545He suitable for all purposes and compacts even medium-weight interlocking paving stone reliably. Compatec, the compaction control by Wacker Neuson, is also available as a retrofit kit for all DPU 4545He models starting with the year 2011. 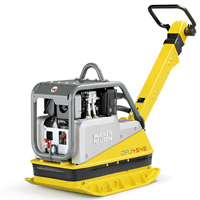 Very low hand-arm vibrations – The particularly designed Wacker Neuson guide handle provides a hand-arm vibration of under 2,5 m/s². This allows for an all-day continuous operation without impairment and risk to the user. All documentation requirements are omitted if an operator only works with equipment that has acceleration values below 2.5 m/s². Intuitive guide handle design – Change the direction of travel and control speed simply by moving the handle forwards and backwards.